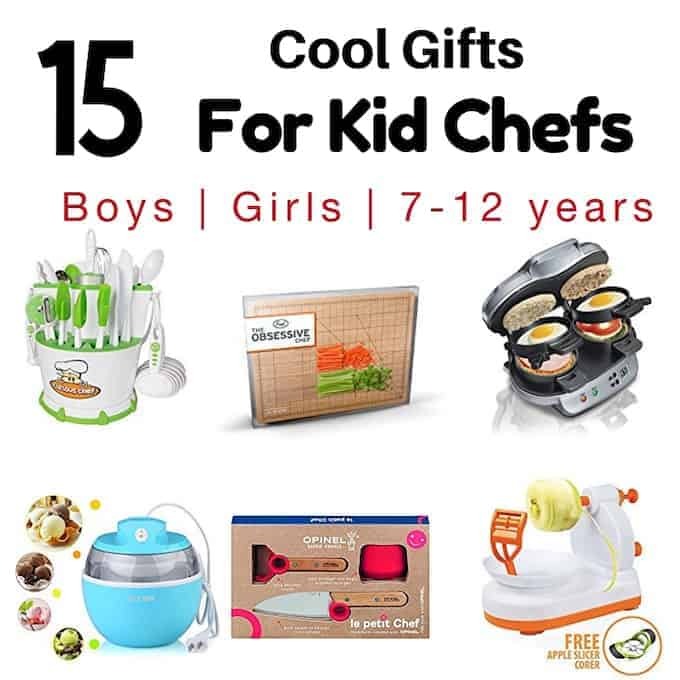 This Best Gifts for Kid Chefs guide includes great ideas for kids of all ages from beginners to advanced. This year, give the children in your life gifts that they won’t grow out of. THIS PAGE CONTAINS AFFILIATE LINKS. IF YOU PURCHASE A PRODUCT THROUGH THESE LINKS, THE COST IS THE SAME, BUT I RECEIVE A SMALL COMMISSION WHICH HELPS MAINTAIN THIS BLOG. 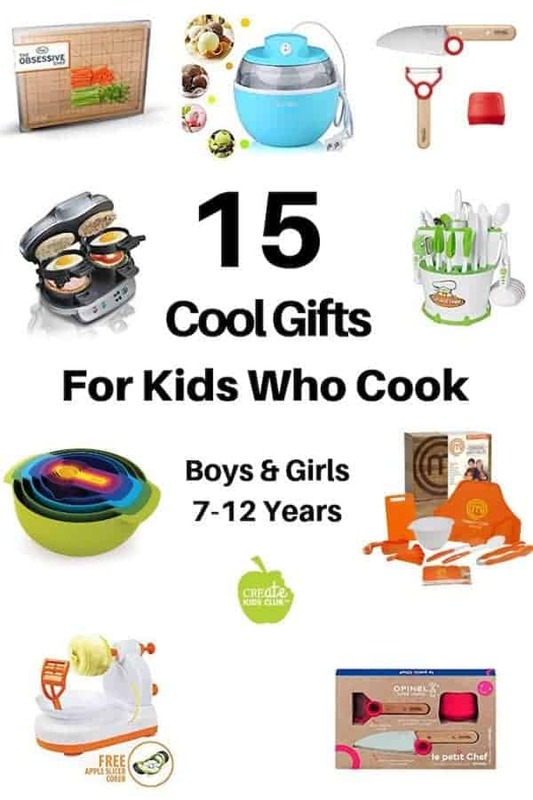 This guide is for you if you’re looking for the best gifts for young cooks that allow kids to be creative, learn their way around the kitchen, and make real snacks and meals. Start building a kitchen toolkit for the little chefs in your life. They will learn lessons that will stick with them forever and have fun too! What It Has: This Cooking set comes with an apron, cutting board, mixing bowl, measuring cups, measuring spoon, spatula, spoon, and tongs along with 3 unique recipe cards for all levels of experience. What To Make: Oatmeal Peanut Butter Bites are a favorite that is super easy for even young kids to make using a mixing bowl, measuring cups and a large spoon. What It Has: This cooking tool set includes a rolling pin, pizza cutter, whisk, measuring cups and spoons and more. BPA free and dishwasher safe. What To Make: Get even the youngest of chefs chopping, scooping, and having fun with these easy Fruit Parfaits. What It Has: This cooking set includes 9 pieces: 1 large mixing bowl, 1 colander, 1 steel sieve strainer, 1 small mixing bowl with measurements, 1 cup, 1/2 cup, 1/3 cup, 1/4 cup measuring cups and 1 tablespoon measuring spoon. All pieces (except for steel sieve) are dishwasher-safe. What To Make: Kids will have fun stiring and measuring using their new bowls when they make some delicious Chocolate Chip Banana Bread or Chocolate Chip Pumpkin Bread. What It Has: This one is for kids who want to learn chopping skills. This board features guides for medium dice, small dice, brunoise, fine brunoise, batonnet, allumette, julienne, and fine julienne. What To Make: Kids can practice their slicing and dicing with these delicious Chicken Pinwheels. What It Has: This beginner knife features a rounded tip and an ‘educational ring’ – designed to promote proper finger placement when using the knife. The vegetable peeler also has the ring to help position fingers for easy peeling. The plastic shield protects the hand that holds the food to be cut. What To Make: Peel apples, then chop them with a yummy Homemade Applesauce recipe. What It Has: This kitchen cooking set includes 8 different shaped molds. Kids can make pancakes or eggs with novel and fun shapes. What To Make: Animal Pancakes are a super fun meal idea for breakfast, lunch, or dinner! What It Has: Kids can create perfect slices every time. Great for cutting potatoes, tomatoes, onions and more. What To Make: Hasselback Potatoes are a delicious side dish and fun to make! What It Has: This super fun kitchen tool peels potatoes, pears, apples or whatever else you’d like peeled. It’s dishwasher safe for easy cleaning and safe to use by kids. What To Make: Easy Baked Apples are simple to make and kids love the bright flavor of cinnamon and sugar. What It Has: This cooking tool has a pulley handle that makes it easy for small hands to use and a fail safe valve that doesn’t leak. Use it for pancakes or for filling muffin tins. What To Make: Blueberry Muffins are always a hit with family members of all ages. What It Has: A kids cooking set where kids can make 2 sandwiches at a time that are ready in just 5 minutes. Kids choose their bread and layer on the fixings: egg, cheese, precooked meat, or the ingredients of choice. All removable parts can go in the dishwasher. What To Make: Black Bean Quesadillas would be delicious or try one of these 9 Sandwich Ideas for Kids. What It Has: This cooking tool for kid chefs has a curved shape in the bottom to easily fit potatoes, cucumbers, zucchinis, radishes, yams, apples and more. Makes french fries a breeze. What To Make: Super Crispy Homemade French Fries are a recipe all kids will be excited to make – and eat! What It Has: This cool gift for kid chefs lets them experiement… and eat it too! It’s recommended for ages 10 and up. What To Make: This cooking kit has the “recipes” all inside the box. Use cabbage to make fizzy drinks, color changing foaming jelly, polymer pudding and much more. What It Has: A fun gift for kids is this Air Popper, which cooks popcorn faster than a microwave. It’s cheaper as well and there is even a butter melter on top. What To Make: Pop the popcorn and have your kid chefs make one of these delicious Popcorn Seasonings. They make great gifts too! What It Has: This gift for kid chefs is electic, no light bulbs are needed. It includes a baking pan, pan tool, chocolate brownie mix, vanilla frosting mix, rainbow sugar crystals, and instructions. What To Make: You don’t have to buy mixes for your childs easy bake oven. Let them mix up their own creation or try one of these Homemade Easy Bake Oven Recipes. What It Has: A cooking gift for teenagers and small kids alike. This ice cream maker makes a half pint with the ease of the push of one button. What To Make: Start with a basic Vanilla Ice Cream and work your way from there! If you enjoyed this post or made any of the recipes, make sure to leave a comment below! Then follow me on social media and tag #createkidsclub. I love seeing what you come up with! These are perfect gifts for my girls. They are having such fun being in the kitchen with me. I love these ideas! Will be putting some on my kid’s gift lists. What great gifts for a thriving little chefs! That is for sure! It’s so fun to watch my kids play this this thing over and over. While I never had one growing up, my older sister did. I don’t remember it holding up quite as well as the one we have at our house does – we are going on 7 years! Those egg shapers are adorable! Adorable. So smart to teach kids to cook! This is such a cool post! I’d love to get my niece and nephew in the kitchen. I’ll have to check out some of these gifts! This is amazing! My daughter is definitely getting at least a couple of these. Thanks for posting! Very cool!! Some great ideas here!! Some really great ideas! I love the mini ice cream machine, cute!